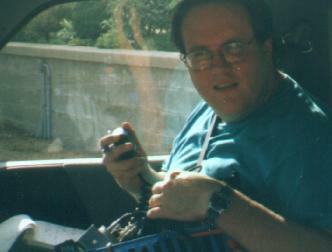 He is my wife (N9SFT) and I (ex-KA9VAW, now W0FMS) in our first attempt at a contest. My wife doesn't like to be photographed, and as such managed to control the camera to the point of us not having a single picture of her for the whole weekend. I am sure the Radio Farm guys will remedy that during field day! Anyway, after the contest began, I smoked my 2m Mirage amp by hooking it up backwards. (Antenna in and Radio in swapped) This was odd that I blew it up as the preamp was turned off (I never used the hunk-'o'-junk MOSFET preamp in it anyway). A properly designed amp would have both relays switched in the Thru mode, and nothing should have happened. Well hell, its a Mirage, and its not properly designed. I think I blew of all things a 1N4005 and the U309 FET. Will get to it before the next century. During this time we decided that maybe the only contacts we would get was with each other, so both me (fully equipped) and my wife (Yaesu dual band FM) went out together. As it turned out, my and her only 2m and 70cm contacts were each other. I still don't know why! We activated six (6) grids on Saturday. EN41/EN42/EN31/EN32/EN33/EN43. Which actually only corresponded for 335 miles of driving on each vehicle. Here are some pictures of Saturday's activities. Most of the pictures are on Saturday, as it was Sunny, and we stopped much more often. 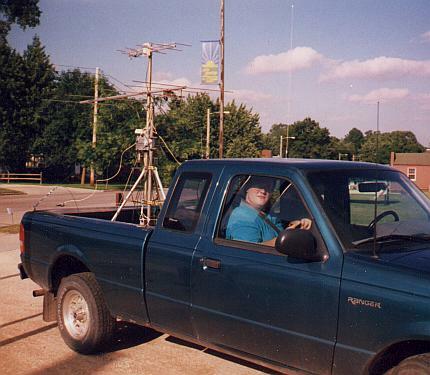 Click here for more detailed "Mobile Antenna Farm"
Who exactly is this goon? Anytime I stopped I'd fly over to the passenger side to get the steering wheel out of my privates. Its pretty cramped inside of a pickup with all of the equipment. 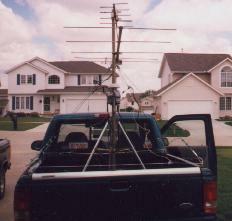 But I still say its one of the better vehicles for hauling antennas! 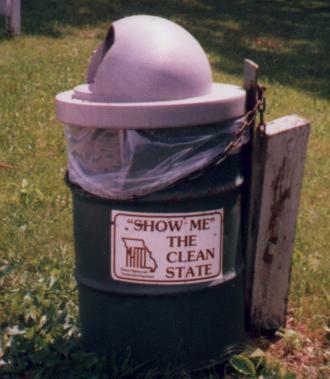 This was in New Hampton, IA right after I contacted the two gentleman from near Edmonton, Alberta, Canada. This was with 8W PEP SSB from my little Ten-Tec 1209 transverter (driven at 2m by a Kenwood TR-751A, this setup works like a CHARM). This is my "Huh? 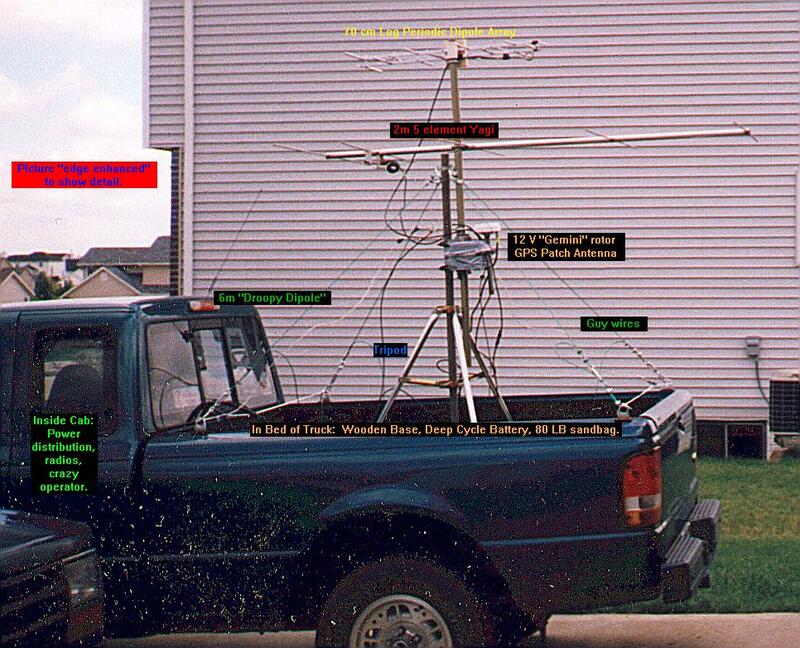 Isn't this a VHF (?!?) Contest" look. Alternate shot of me in New Hampton. Nice picture. Pay attention to the floppy piece if 12 AWG THHN Stranded (white) hanging low off the tripod, and attached to the nylon line in the back and front of the bed. This is all the antenna I had on six. I still managed to get about half the points of the experts (K0DAS and N0LNO). Six is an amazing band. Was actually in the "ball-busting" drivers seat in this picture! We turned in about 10 PM on Saturday night. 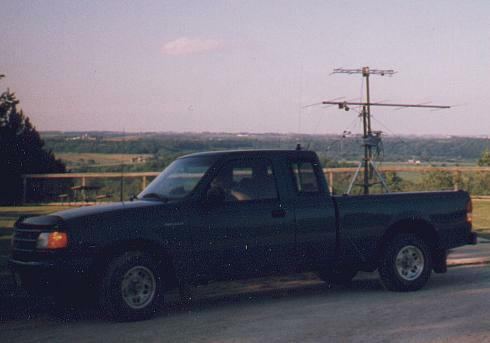 After getting nothing on 2m or 70cm, SSB and FM, but me doing well on 6m SSB, we decided that N9SFT/R would rove no more, and she'd become the driver and I'd operate KA9VAW/R's 6m station exclusively. To keep it legal, she never operated my equipment, but she did help me on the tear down that evening. My wife was like a wild woman! I wanted to do two more grids, but NOOOO!!! Two wasn't enough. Say Hello to EN30/EN40 and EM39/EM49. Here is the MOST interesting thing we saw in EM39. It was extraordinarily amazing how strong my QRP signal got from these grids though. Little pictures, but lots of QSOs. We did about 450 more miles on my truck, to get these four more grids, (ten total) and avoided a tornado by 20 miles and 20 minutes in Missouri. Also drove back through EN42/EN41 in one of the heaviest rainstorms Iowa has ever seen. The propagation on 6m was really strange as we drove between two fronts on the way back, and the bands went dead for the two hour time period we were between the two storms. Freaky deaky stuff. Anyway, here's the inside equipment, taken Sunday night from the driveway with a flash because it was so stormy that it was very dark at the 8 PM time we stopped. Inside equipment rack, Sunday configuration. 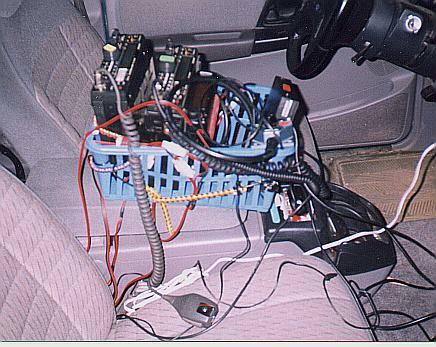 GPS was in the floor board on the passenger side, not shown. Power distribution panel I built out of a 1973 Collins rack I got at the surplus store for $40. This panel was the difference between the perfect performance I got on the road and disaster. 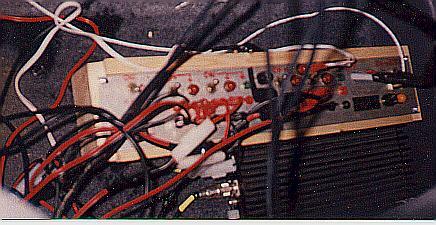 The deep cycle charged off the cigarette lighter via a mondo stud mount diode and this panel. It worked like a charm. One last look at KA9VAW/R before tear down. Note the quality film processing job. 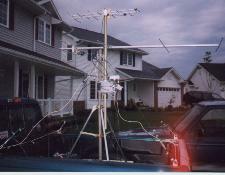 Anyway also look at the 6m droopy dipole, and notice the nice calm Iowa sky that night! I got my wife somewhat interested in ham radio again! I got to visit the region of my new adopted home. (God, its barren out here for someone raised in the Chicago suburbs!) I got to use 6m for the first time! I probably have enough points to make QST. 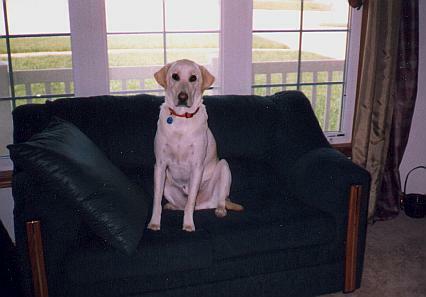 Chauncey the Yellow lab. Wants to be known as "the other contest dog".